Next story in Mars Did human DNA hitch a ride to Mars? 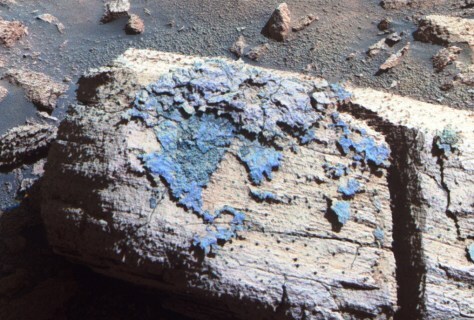 An enhanced-color image of the Chocolate Hills rock on Mars shows a strange coating that one researcher has called a "blueberry sandwich." The coating appears blue in this picture due to the false-color effect, but the naked eye would see this scene in shades of rusty red. Chocolate Hills is about the size of a loaf of bread. Click on the picture for a larger version.